Little Feathered Buddies • View topic - Searching through my threads? Post subject: Searching through my threads? This is a feature I would very much appreciate. Most forums have a button that you click to see all threads you’ve made. I see a button for all the specific posts I’ve made, but I also would like one for threads. Is it possible to ever add this? Maybe we already do but I just don’t see it? Thanks! Post subject: Re: Searching through my threads? There's a way to do it now, but it's not real obvious. It would take a vast amount of effort to make it more user-friendly so I'm not gonna try lol. Click on your own name in the member list or in a thread so your User Profile pops up. You'll see some statistics on your total posts, and a small link saying search user posts. Click on it and you'll get a list, with a search box available if you want to look for something specific. Alternatively, you can go into your user control panel and click on overview. There's a "show your posts" link under the activity heading. But the way this option displays is a lot different than the previous technique, and might not be as satisfactory. I know how to search for posts, but what I was trying to do was to look through my threads. I made about 3,000+ posts. It would be a little hard to scan through it to see the threads I made. So, there isn’t a way to add it? I can go on phpbb (like I did when we wanted to get more emojis) and see if there’s a walkthrough to add a users threads button. You don’t have to do it, of course. I just felt like this feature can help me (and maybe others) out if I needed to see a previous topic I/someone else made. Have you tried using the search box that only looks within your own posts? I find that it works pretty well. But it refuses to look for words that you've used too many times. 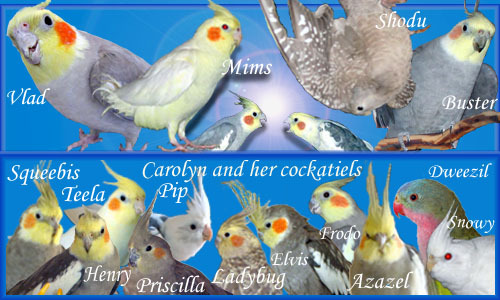 For example if I look for lovebird within my own threads I'll get a list, but if I look for cockatiel it says no way Jose. Yes. I saw the search button, but sometimes I want to take a trip down memory lane. It’s ok though, don’t worry about it. If you want memory lane, you can just follow the link to all your posts and flip through the pages in a semi-random way. Look at page 1, then page 6, then page 11, that sort of thing. Looking at all of them would be a nuisance, but looking at one here and there is more interesting.